ORNL inventors Bruce Warmack, left, and Nance Ericson display an early prototype of the DC hotstick. Credit: Carlos Jones/Oak Ridge National Laboratory, U.S. Dept. of Energy. 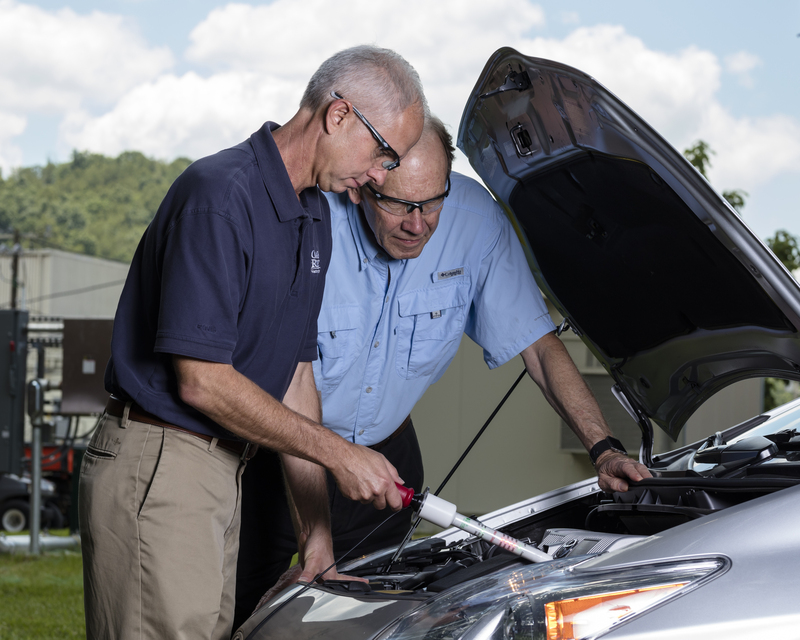 Nance Ericson, left, and Bruce Warmack of ORNL test the DC hotstick on a hybrid electric vehicle. Credit: Carlos Jones/Oak Ridge National Laboratory, U.S. Dept. of Energy. The DC hotstick voltage probe can accurately detect the presence of DC voltages in a hybrid electric vehicle. Credit: Carlos Jones/Oak Ridge National Laboratory, U.S. Dept. of Energy. OAK RIDGE, Tenn., May 21, 2018 – North Carolina-based Hotstick USA has exclusively licensed a direct-current detector technology developed by the Department of Energy’s Oak Ridge National Laboratory to help emergency responders safely detect high voltages. In emergency situations, first response teams often rely on voltage detectors such as Hotstick USA’s flagship product, the AC Hotstick, to sense the presence of dangerously high alternating current, or AC, electric voltages from a safe distance. The increase in electric vehicles on the road and solar panels on homes means high voltages could also originate from direct current, or DC, sources not accurately detected by existing technologies. “This new tool protects them as they’re protecting others and saving lives,” he added. 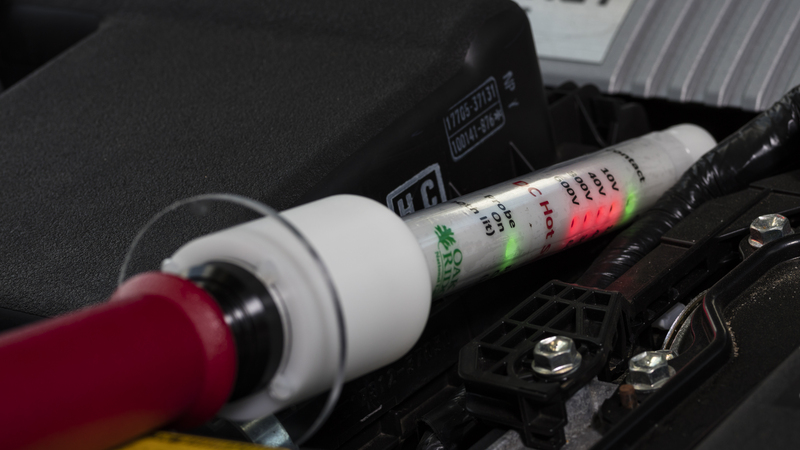 The DC hotstick prototype is a handheld device equipped with easy-to-read indicator lights that show whether the probe has established a connection and whether the electricity source is hot. In a crash involving an electric vehicle, for instance, the car’s battery could still be connected and energized at a deadly 400 to 600 volts. The probe is designed with a novel piercing tool to cut through plastic cable insulation that may obstruct contact with the vehicle’s battery and to indicate that a valid electrical connection is made. “This ensures good contact for an accurate voltage reading in a situation where decisions must be made in seconds,” Warmack said. After further development, Beckmann expects the DC hotstick to complement the company’s existing AC sensing technology, which is the market leading device, and satisfy the need expressed by many customers. Inventors of this technology include ORNL’s Warmack, Ericson, Yarom Polsky and Roger Kisner.